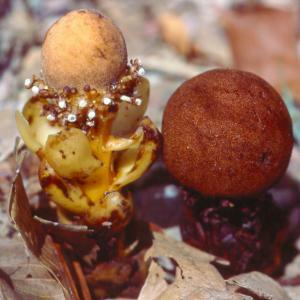 Each flowering stalk of Balanophora fungosa bears thousands of female flowers (the top portion) and a much smaller number of male flowers near the base of the flowering stalk. About twenty male flowers can be seen on the flowering stalk at left (they have white tips). The flowering stalk at right is older, and the male flowers have faded.